Welcome to the Sinister 7 Ultra. The event has become a tradition for many people and we will do whatever we can to live up to your expectations. This document is made up of information found throughout our website, but it is all on one convenient page so that you can print it easily. We live and play in Crowsnest Pass so we are constantly reminded that the Sinister 7 Ultra course is truly magnificent. The race combines some of the best trails in the area with viewpoints and scenery that only a few people ever get to enjoy. With 6,321m of elevation gain across the 160km of rugged terrain that makes up the course, this race is not for the weak of heart. We cannot stress enough the fact that this race is incredibly difficult. Be prepared for one of the toughest experiences of your life. Both solo and relay runners alike will find this race challenging. Thank you again for signing up and we look forward to seeing you at the race. The following changes to the course and race format all come from racer requests and our own logistical concerns. Everything is detailed elsewhere in the document but here is an overview. Crowsnest Pass may be Alberta's best-kept secret. Located in the southwestern corner of the province, the Pass is nestled into the Rocky Mountains just outside of the Continental Divide. Home to stunning views, abundant wildlife, challenging terrain, and a supportive community, it was only natural to bring the Sinister 7 Ultra to the area. In the early days, the Pass was a community focused on resources. The extraction of coal and timber drew many people to the area, who then settled into one of the many towns now making up the district. Although faced with many tragedies, such as the Frank Slide of 1903 and the Hillcrest Mining Disaster of 1914, Crowsnest Pass became a well-populated and thriving community. Today the community is made up of the neighbourhoods of Bellevue, Hillcrest, Frank, Blairmore, and Coleman. The ruins of former towns, like Lille, stand in testament to the legacy of the area. Supported by a strong volunteer base, Crowsnest Pass offers many amenities to its visitors and residents. Attractions such as the Frank Slide Interpretive Center, the Crowsnest Museum, and the Bellevue Underground Mine welcome visitors for daily tours. Crowsnest Pass offers boundless recreational opportunities. Whether your interest is running, mountain biking, rock climbing, ice climbing, scrambling, road biking, white water paddling, cross country skiing, snowboarding, downhill skiing, or fly-fishing, there are endless opportunities to get out and play. Book your accommodations early; rooms fill up fast here in the summer. You will be hard pressed to find a bed after January. We have a user generated accommodation database: http://www.sinister7.com/accommodations.php. Listings are posted for both home-stays and formal accommodations. This database will grow throughout the year so keep checking back. Most of the accommodations in the community are B&Bs and Holiday Homes. Please visit the Crowsnest Pass Holiday Home Association website: http://www.crowsnestpassholidayhomes.com/. You may also book campsites near TA2/TA3 and next to the Finish area in Coleman by going to the Camping section of the Accommodations page. You must book ahead to reserve one of our campsites. The community maintains a campsite in Bellevue, just off Hwy 3, on a first come, first served basis. You can also camp for free anywhere in the forest reserve that surrounds the town. Some racers with RVs like to camp at TA5/TA6. If you cannot find a room and you do not mind driving a little further, also check in the towns of Fernie, Sparwood, and Pincher Creek. The closest airports to Crowsnest Pass are in Calgary and Lethbridge, Alberta or Cranbrook, British Columbia. A wide variety or domestic and international carriers service Calgary International Airport. Both Calgary and Cranbrook airports are approximately a two and a half hour drive from Crowsnest Pass and Lethbridge is one and a half hours, however fewer airlines fly there. Please use this map for basic driving directions to Crowsnest Pass and the key locations on the course. We will also have driving directions available at Registration. Race package pick-up and sign in will be held at the Crowsnest Sports Complex in Coleman from 13:00hrs to 21:00hrs on Friday. Solos will also check in drop-bags, if necessary, at this time. We do not accept drop-bags on Saturday morning. The Sports Complex is also the Finish Line and the post-race awards dinner will be held here. You are allowed to bring an RV and camp in a designated area or tent on the adjacent grounds. The Boys and Girls Club runs camping and a fee will be taken for RVs, which goes to help fund this deserving charity. Vehicles are not allowed in the tenting field so you must walk any gear to the site. Please see the map below. You are welcome to store gear in the Sports Complex but we do not have people to monitor anything that is left behind. The race start is located on 20th Avenue in Blairmore, in front of Gazebo Park. This is just to the east of the centre access to the area. Several blocks will be shut off to vehicles to allow us to have the start here. Please look at the map for parking areas. We suggest that you park at the Albert Stella Memorial Arena (TA2/TA3) and walk over from there – it is only a few blocks and there is a lot more room in this area. Shuttle from Crowsnest Sports Complex to the Start Line: This bus will depart from the host site at 6:15hrs and will drop runners at the start line. Shuttle from Start Line to TA1: This bus will depart from the start line shortly after the race start at 7:00am, and will drop runners at TA1. Each bus returns to Blairmore when it is full. Shuttle from Finish Line to TA2/TA3: For any unsupported solo runners who wish to camp near the start line, you may park and camp near the Albert Stella Memorial Arena, which is TA2/TA3. We will have a van available to shuttle these runners back to their vehicles from the finish. Please do come back to the finish line for the awards! There is additional camping available northwest of the Albert Stella Memorial Arena. This site has limited parking and RVs are not allowed in the parking lot. RVs may camp in the fields north of 19th Ave for a small fee, which goes to the Boys and Girls Club. Note that you are not allowed to camp within 50’ of the CP Rail tracks. Vehicles are not allowed in the tenting field so you must walk your gear to the tent site. As mentioned above, for unsupported solos who choose to camp at TA2/TA3, we will have a shuttle van going back and forth from the finish area to the Albert Stella so you can leave your vehicle here if you need to. Camping is available at the Host Site. All of our camping is available by reservation only and all proceeds go to the Boys and Girls Club of Crowsnest Pass. Book Here. We love dogs (we have two) but they can cause a great deal of disruption for racers and create extra mess that is not appropriate around the areas that make up the host sites. If you do bring your dog, it must be on leash at all times around the host site and all transition areas throughout the race. Dogs are not allowed near the food areas at TAs, inside the Albert Stella Memorial Arena, or inside Crowsnest Sports Complex at any time. 13:00 hrs – 21:00 hrs; Race check in opens (Crowsnest Sports Complex, Coleman). This includes getting your race number, timing chip, submitting the mandatory waiver, picking up gift bags, and checking in any drop bags. Drop bags will not be accepted on Saturday morning. 18:30 hrs – 19:30 hrs; Pre-race meeting (Crowsnest Sports Complex, Coleman). All competitors should attend. If teammates are not available, the captain may act as a designate but must communicate all information to the team. 06:15 hrs; Shuttle bus leaves from the Crowsnest Sports Complex (Coleman) for the start area at Gazebo Park. This shuttle is primarily intended for unsupported solos who camp or park at the Sports Complex. 06:30 hrs – 06:45 hrs; Runners should congregate at the start area. 07:00 hrs; Sinister 7 begins! 13:00 hrs; Sinister 7 ends! 13:15 hrs; Awards ceremony begins. All racers should plan to attend the pre-race meeting the day before the race. We will talk about the course, safety, and any last minute changes that may occur due to trail conditions, weather, or animal activity. Most importantly, this will give you a chance to check in without stress and allow us to welcome you with a dinner hosted by the race organizers and our sponsors. The meal is included as a part of your registration. Extra meals will be available for purchase at the race. Celebrate the Sinister 7 with your fellow Sinners. Competitors receive tickets to the post-race meal and awards as part of their registration. Extra meals will be available for purchase at the race. Everyone is welcome, whether or not you finish the race, so please do stay and share your experiences. We will also honor racers for achievements such as “first blood”, the Marty Lund Spirit Award, and more. Stick around – who knows what awards you may qualify for. Extra meals will be available for purchase at the race. Be prepared; the Sinister 7 Ultra may be the toughest experience of your life. We do not want to downplay the intensity or severity of this race in any way. You need to be ready through training and planning. During the race, you will be in some very isolated areas and may not have immediate access to facilities, or assistance of any sort. If you are running solo and cannot complete the 161km in the less than 15 hours, you will be running in the dark. The Sinister 7 is as mentally demanding as it is physically grueling. When you have been running for hours on end, your mind will give you a million reasons to quit - you have to decide that it is more important to finish. Relay racers can expect to run from 11km to 36km on rugged trail, depending on the leg you chose. Runners on legs 4, 5, 6, and 7 may be running in the dark, depending on how fast you, or how fast your team runs. Each leg is a little different and some will take you far out in the wilderness. We cannot stress enough that you will need to be self sufficient when you are out there and the help you receive on course is very limited. Please note that any course descriptions in this document are subject to change due to environmental factors, weather, and animal activity. We will do our best to update you if changes arise prior to the race but we will confirm all of the details at the pre-race meeting. You will be running in remote wilderness, and the chance of injury is very real so prepare to be self-sufficient. We hire top-notch medical staff but they cannot be everywhere at once. If you are injured out on the course, be ready to hunker down for a few hours until a course sweeper or medic comes by. If you are injured but able to move, try and make it to the nearest Transition Area or Checkpoint. If not, try and send word with another racer. Race marshals on foot, bike, and ATV will sweep the course approximately one hour after all runners have started the leg. Please take the time to read the Emergency Protocol document on our website. There are definitely bears and cougars in the area. If there is reported activity around the course prior to, or during the race, we may modify the course. We cannot predict random animal activity so please stay alert. Take note of the information below on what to do if you approach a bear or cougar on the trail. We may dress up in bear suits to “motivate” runners; please do not pepper spray bears if they are wearing Sinister 7 t-shirts and running shoes. If you drop out of the race, it is essential that you contact the race directors at either the nearest Transition Area or the race HQ (Albert Stella Memorial Arena). If you do not, we will assume you are lost or injured and we will be out looking for you. If we mobilize a search party, you will be charged for any search and rescue fees that are incurred as this takes up valuable resources. Please just take a few minutes to check in. Even if you do drop out, we want you to join us at the awards lunch so you can share your stories and let us wish you on your way. Every year we get a report of a racer seeing a bear or cougar on the couse. The reality is that most encounters with these animals rarely lead to aggressive behaviour and attacks are even rarer. Bears especially prefer to avoid contact with humans, and any animal you do see is probably just as frightened as you are. The best way to prevent an unpleasant encounter is to avoid them all together. Bears and cougars usually avoid people, and most people don’t even know when they’ve come close to an animal. To ensure a surprise or unpleasant encounter doesn’t occur, try to remain with other runners as much as possible and make lots of noise by talking or singing. Put the iPod away and pay attention to your surroundings. Both solos and teams have 30 hours to complete the Sinister 7. After that, you will not be able to continue the race. Each leg also has a cutoff time; you must keep up with these times or you will not be able to finish in 30 hours. In addition, you must also start each leg by a specified time or you will not be allowed to continue. The start area is located in front of Gazebo Park in Blairmore. Parking for the start is located at the Albert Stella Memorial Arena, and along the railroad tracks just off of 20th avenue. The finish area is located at the Crowsnest Sports Complex in Coleman. Between each stage of the race is a Transition Area (TA) where you will be able to access supplies, meet your support crew or relay runner and take a break in relative comfort. TAs will also have some basic facilities such as portable washrooms, snacks, water, and shelters. When you finish a leg, there will be a chute that you will follow in order to check in, get your time, and continue on the next leg. This is also where relay runners will tag off. These chutes are extremely visible and will have large signs stating the end of the leg and where to go for the start of the next leg. Staff and volunteers will be waiting at the chutes to assist you if required. Some TAs are used multiple times so it is critical that you follow instructions in order to avoid confusion. We know you will be tired and probably delirious, but please be aware of the signs. TA5 and TA6; these are in the same location and share a bag - this is a critical point as it is extremely remote and follows one of the toughest sections of the race; think about warm clothing and special foods to keep you going. Look at the course and plan your drop bags accordingly. We will provide labels for your bags at racer registration. Racers must submit their drop bags on Friday before the race. No bags will be accepted on Saturday morning. Bags will be placed in a line at the TA in whatever order they come off the truck so make your gear noticeable. Use a weatherproof bag, as we may not be able to shelter this gear. We also will not transfer drop bags, or any gear, from place to place so put what you need where you want it. If you feel you can get by without support or drop bags at every location, this is perfectly acceptable. Drop bags are intended to act in lieu of a support crew. If you have a support crew, please do not leave a drop bag with us unless absolutely necessary. Any gear left with us will be returned at the end of the race. You will need to meet the previous runner on your team at the TA that ends their leg. For example, if you are running Leg 2, you need to meet the runner from Leg 1 at TA1. There is a designated chute for racers to enter and leave a TA. Please do not linger at the entrance or exits to the chutes – this holds up everyone else and creates a traffic jam. Try to be at the TA, ready to meet your runner, 30 minutes before they are expected. We are not able to give ongoing updates as to where runners are on the course so it is up to you to be ready. If you are not at the TA when your runner comes in, you do not get any time credit. There are also several cutoff times, which are listed on pages 15-22. If a team cannot keep up with these times, they will be given a forced start or disqualified. In the event of a forced start, relay racers are more than welcome to run but without an official time. If this is the case you still must start by the specified time. You can find driving directions to TAs here. The course is further divided by several Checkpoints (CPs) staffed by race marshals. These locations are typically remote and act as safety points. All CPs are equipped with a radio and some have emergency supplies. You can expect at least one checkpoint per leg and the distances vary. The Sinister 7 course will be well marked with flagging, paint, reflectors, reflective markers for night sections, and coloured direction signs. There should be no guesswork when it comes to following the proper route. We cannot flag every 100m of the course but we will put markers in critical areas. All trail and road junctions will have a number of markers to eliminate any doubt as to the right direction. We will talk about course markings at the racer meeting. Remember: It is still up to you to stay alert and watch for these signs. We will do our best to make them frequent and visible, but the rest is up to you. We highly recommend reviewing the route on our website and making a visit to the area to run the course ahead of time. If you have a GPS, the routes are available for download on our website at http://www.sinister7.com/course.php. We will have a variety of snacks available at all TAs and some “real” food later in the race. We cannot accommodate every need so please plan to bring anything you really want via support crews, drop bags, or your next racer if you are on a relay team. Any CP that is accessible by road will also have water and snack food. We recommend that you be prepared to drink from streams or rivulets if you need water when higher up in the mountains. The water in the area is generally clean, and besides, illnesses like Beaver Fever take about two weeks to manifest symptoms so you should be fine for the duration of the race! Also note that all food and supplies are for racers and volunteers only. Relay runners are welcome to eat at aid stations on their leg but bring your own if you are visiting other TAs as a spectator; we do not want to run short. CP: Checkpoint, also "Water Station" or "Aid Station". Disqualified: A competitor or team that has not completed a mandatory section of the race, or has been removed from the event by Race Administration. DNF: Did Not Finish, also "Disqualified". DNS: Did Not Start, also "Disqualified". Leg: Also "Stage"; any one of the seven sections of the race that ends in a Transition Area or the Finish. Pacer: A runner who is enlisted specifically to assist a Competitor finish a stage of the race. Relay: Also "Team" is a group of people running specific portions of the race. Solo: An individual running all seven stages of the race on their own. TA: Transition Area; a large aid station where relay runners transition, and solo runners may receive support. Competitors are required to check in at registration by 9:00pm on the day prior to the race, and sign a waiver provided by the Sinister Sports Inc. A competitor is considered DNS without a signed waiver. Competitors are responsible for their own medical coverage and all costs incurred by any form of rescue services, treatment, or hospitalization if they are injured during the race. If emergency evacuation is required, the cost will be the responsibility of the individual in need of assistance. This includes the cost of airlifting and helicopter or ground search if required. The race officially begins at 7:00am on race day. All teams and solo competitors have 30 hours to complete the course for an official ranking. Each leg of the race has a cuttoff, and competitors must start the next leg by the time listed. If a competitor cannot finish their leg by this time, they may be instructed to pull out of the race. Cutoff times are available on the course page of the website. The only means of travel on the course is self-powered and on foot (running, walking, crawling); using any other means of travel will result in disqualification. The timing chip is property of Sinister Sports, or it's suppliers, and must be returned at the end of the race. A timing chip and bib number must be worn while on the course or the competitor is not considered a participant in the race. The bib must be worn on the front of your body so that it is visible to race marshals. Competitors must check in at all CPs and TAs. Your number and time will be recorded before you continue on the course. If a relay competitor is not ready at a TA when their previous runner finishes a leg, the team’s race time continues to elapse. No time credits will be given if your runners are late showing up at their TA. The course is marked and runners must adhere to the designated route; any deviance or short cuts will result in disqualification. During any road sections, competitors may only cross highways and roadways at designated, marshaled locations when safe to do so. If any act of nature or uncontrollable act takes place that inhibits your progress on the course (eg: train crossing, rockslide) no time credit will be given; these factors are a part of the race. Competitors are allowed assistance (eg: support crew, volunteer, race marshal, or bystander) only at designated TAs. Accepting assistance outside a TA from anyone besides a registered competitor (see 16), or race medic, will result in disqualification. You can receive assistance from appointed race medics anywhere on the course, even outside of designated TAs, providing that the assistance is not in the form of transportation. Relay competitors must finish the entirety of their designated leg(s) of the race. If the relay competitor must withdraw part way through their designated leg, the leg must be started over with a new runner and completed within the cutoff times in order to receive an official time. Competitors may run with a solo competitor who is competing on the same leg of the race, and has not been marked as disqualified. Competitors may run with a relay competitor who is designated to run that specific leg of the race, and has not been marked as disqualified. any individual may join the competitor within 300m of end of a leg in order to show support to the competitor as they finish. Competitors are not allowed to cache food or gear along the course except at designated Transition Areas. Any competitor found using, or supplying performance-enhancing drugs to other competitors, will be disqualified and permanently barred from the Sinister 7. See http://list.wada-ama.org/ for banned substances. Sinister Sports Inc. respects any existing bans and will comply with any investigation undertaken by anti-doping agencies. Any competitor that drops out of the race must notify the nearest race marshal or director at the earliest opportunity. Do not drop out of the race without telling race officials as this will result in a costly search and you may be billed. Medical staff and/or Race Directors may remove any competitor from the racecourse if they feel it is unsafe for the competitor to proceed (eg: natural hazards, hypothermia, dehydration, frostbite, debilitating injury, unprepared for weather events). Any disputes with the racecourse, race results, course management or the actions of other competitors must be submitted to the Race Director, in writing, within 30 minutes of the end of the race. If not received within this time, complaints will not be considered. **We do not encourage teammates to run together as it is meant to be one person per leg, however, we recognize that teammates often run together in order to show support to young or new runners. The runner designated for that leg is the one who must run the entirety of that leg. For safety reasons, Race Administration must be aware that additional runners are on that stage of the race. The weather conditions in the Rockies can change dramatically in a short period of time. A light drizzle combined with 80km winds will cause hypothermia in short order, unless you are properly equipped. Some of the higher areas of the course will still have snow in July. You may be on your own for several hours if something goes wrong. We suggest you carry the following gear. You will be in remote wilderness, and you are responsible for your safety. If you are injured it may be several hours before we can reach you, so you need to be prepared. Do not think it will not happen to you! Weather changes quickly in the mountains, and every year we have racers that DNF due to environmental conditions, so prepare accordingly. You may elect to carry additional gear, like bear spray, at your discretion. 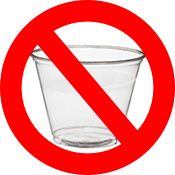 Note: We do not supply disposable cups at our aid stations, so you must have a vessel if you want water or electrolyte. You are welcome to refill bottles and bags. Performance-Enhancing Drugs: See Rule #19. All distances and elevations have been verified by GPS at maximum 10m point intervals, as per ITRA standards. 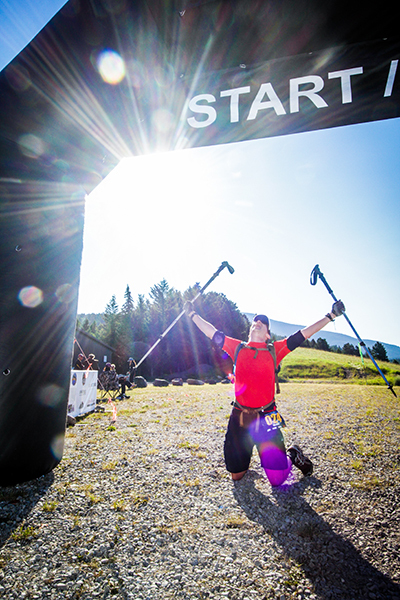 Difficulty is based on how hard the leg is in comparison to the other legs of the race, in our opinion (ie: Leg 6 is 7/7 meaning it is the hardest). Every leg of the race is hard. The first leg of the Sinister 7 crosses the massive debris field of the Frank Slide. Spread over several kilometers, the slide consists of rocks and boulders as large as houses. Experts say the mountain will fall again one day; maybe tomorrow, next week, or next year... After the Slide, the route passes through the town of Hillcrest and through Bear Valley to the base of Hastings Ridge. Beginning at the base of Hastings Ridge, runners begin a grueling climb to a rewarding view. Once atop the ridge, you get a view of the entire valley, including Crowsnest Mountain and the Seven Sisters; certainly worth the punishing climb to the top! There is no time for rest as runners drop down the other side and head towards Blairmore to the finish of leg two. Also known as "Satan's Sack", Leg 3 is dry, hot, and exposed. This leg of the Sinister 7 has the second most elevation gain and distance. In return, you are rewarded with stunning views of the mountains atop the Continental Divide! This leg crosses through the haunting remains of the 2003 Lost Creek fire where one feels as though they are on another planet. After passing the burn scar, runners once again climb back into Blairmore for the start of leg 4. Leg 4 throws it all at you; tough climbs, water crossings, rugged ground and some fast trail! Straight out of the gate we welcome you with a climb half way up the ski hill. While gasping for air don?t forget we also include some beautiful views with some great photo opportunities. Leg 5 presents some good old classic cross-country running. Connecting runners from the south end of the course to the north end, this leg presents you with a great cross-country style run alongside Mt. Tecumseh. You can guarantee to be hit with big gnarly roots, water crossings, mud holes and just enough climbs and descents to leave you begging for it to finish! This Leg will try the toughest of racers. This route takes runners through some of the most remote terrain on the course as they make their way to the evil climb north of Seven Sisters Mountain. While catching your breath at the highest point on the course, don't forget to check out some of the larger mountains in the area: Crowsnest to the south as well as Tornado and Gould Dome to the north. There is no time for rest as runners drop to the west and make their way around the base of Crowsnest Mountain along trails and numerous drainages. Sure footing is key on this section as you round the southern edge of the mountain and arrive back at the McGillivray staging area to begin the final leg of the race. The final leg begins with a steep, ugly climb up the base of Wedge Mountain, followed by an incredible single track descent into the Nez Pierce Creek valley. Following another single track trail along the western slopes of Saskatoon Mountain, runners emerge in north Coleman. Be sure to save some energy for the last push to the finish line! *Distance to CPs accurate to within 500m. Support people (aka Support Crews) are typically only required for solo runners as most relay runners do one leg and hand off to a teammate at the Transition Area. A good support person can truly be the lifeline for a solo racer. Nothing beats coming into a TA where there is food, fresh gear, and encouraging words waiting. Support people help keep their racer moving. If you intend to support a racer, do not be afraid to ask questions – we want your experience to be as rewarding for you as it is for the competitors. Do not plan on cell phone coverage while in the more remote TAs. Any emergency communications should be done through Race Staff, who are all equipped with a radio. We do not have the ability to track all racers on the course at all times so please refrain from asking for competitor updates. Some Transition Areas (TAs) are tight and excess traffic makes it difficult for everyone, so please try and keep the number of support vehicles you have to a minimum. You do not need a 4x4 to support this race, but a vehicle with good ground clearance will make it easier on you. Trailers and RVs are acceptable but, again, some TAs are tight and you will find it difficult to maneuver. You will be moving at odd times during the race, so be prepared to drive at night. You will drive primarily on pavement, but some TAs are accessed by gravel roads. Be sure you have a spare tire, a jack that works, and know how to use them. You may be out of town for a long while so bring what you need to be comfortable. We will have printed copies available at the host site. You are able to drive to all TAs to meet your racer. Once your racer starts on a leg, you should make your way to the next TA and set up for their arrival. You can find all of the driving directions online HERE, or pick up a copy at race check-in. If your racer doesn’t look well (delirious, dehydrated, or somehow broken), please contact our staff. The racer will not be disqualified for receiving basic medical aid.